Itinerary -Start from Delhi to Reach Shimla: It takes 8-12 hours by road depending on the mode of tr..
Itinerary -Day 1:Delhi/ Bombay to Leh• Arrive at Leh airport, to be received by ou..
Itinerary -Day 01: Arrive DelhiOn your arrival you will be met by our representative at the airport ..
Itinerary -Day 01: Arrive Manali (2030m)Arrive in Manali. 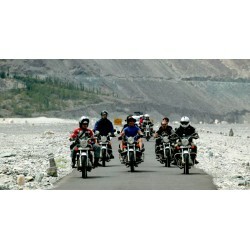 Today you have the option of taking it eas..
Itinerary -Day 01: Delhi – LehWe shall fly to Leh in the morning from Delhi. On arrival, check-in to..
Itinerary -Day 00 :Arrive Bagdogra/ NJP from across India by flight/ train.Stay at Bagdogra, arrange..
Itinerary - STAY AT DELHI HOTEL –00 NIGHTORIENTATION DAY Day one is a very important days as th..
Itinerary -Day01: Manali – Rest/ExplorationArrive in Manali. Today you have the option of taking it ..
Itinerary -Day 01: Manali (2050m) Arrive at Manali & check into the guesthouse..
Itinerary -Day 01: Delhi - ChandigarhUpon your arrival at Chandigarh you will meet our representativ..
Itinerary -Day 01: Delhi - Kalka (by train) - Kasauli (30 Kms)In the morning, we will board Shatabdi..
Itinerary -Day 01: Arrive DelhiArrive Delhi and meet our representative who shall assist you to your..
Itinerary -DAY 00-NIGHT STAY AT DELHI STAY AT DELHI HOTEL –00 NIGHT ORIENTATION DAY Da..
Itinerary -Day 01: Arrive DelhiOn arrival you will be driven to your hotel by our representative. Ov..
DAY 1 – Arrival in Delhi May be night flightsDAY 2 Coming to Namoh to take trials of the bike..
Itinerary -Day 01: Arrive DelhiOn arrival, our office representative will meet and assist you to you..